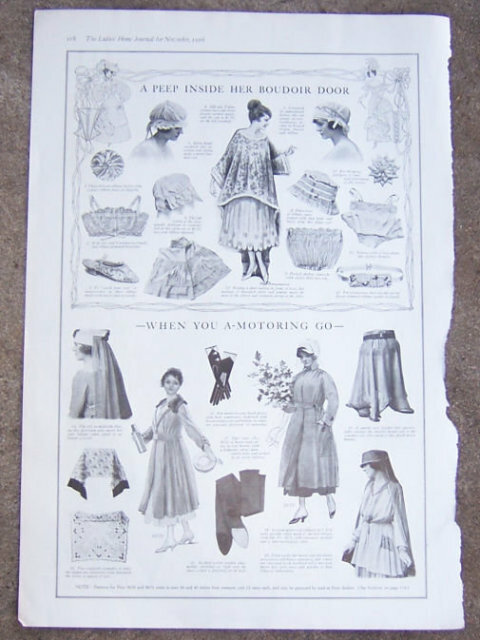 1916 Ladies Home Journal Clothes for the Boudoir Door and Motoring. Page is filled with Outfits and Accessories for Inside her Boudoir Door and for When You a-Motoring Go. Page is 16" high and 10" wide. Page is in very good condition, slight wear and small tears at edges, suitable for framing. Items Similar To "Clothes for the Boudoir and Motoring 1916 LHJ Page"